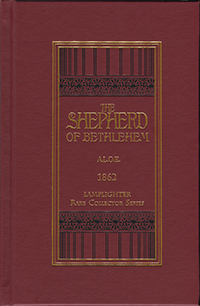 The Shepherd of Bethlehem is part of the Epic Collection. What do two spoiled brothers, an illiterate servant girl, a salty old sailor and the town mischief maker have in common? You'll find out in this exciting book by A.L.O.E, the first volume of the Heroes of Faith Series. There is no question that The Shepherd of Bethlehem will bring the Scriptures to life like no other book, as a fresh look at David's life reaches deep into your heart, cutting and pruning and drawing you ever closer to your very own Shepherd - your very own King! From Diana Yoder of Dundee, Ohio on 7/19/2016 . Beautifully written. I love the way A.L.O.E weaves bible stories throughout the book, and with this one, how every character can relate to David and the lessons he learned along the way.